Every action, every thought, every feeling is your child creating a self-portrait of who they are and what they need to grow. It’s up to us to see, hear and cherish that child and that expression…even if the “portrait” has an extra eye or has legs coming out of the head! Young children do not and cannot see themselves “as they are” – nor should they. It is developmentally impossible – a child’s sense of self is “under construction”. They see themselves from the inside out, through the reflection in our eyes, and from interacting in an over-sized world. Remember when your toddler tried to climb into a too-small toy car to drive around the house? He knew he was bigger than the car but he still didn’t know he didn’t fit inside! How about when your child bit her best friend or threw her favorite spaghetti in your face and then wanted it back again so she could finish it? They know and they don’t know. 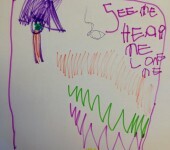 See Me Hear Me Love Me – Help Me! The cornerstone of all development is to meet kids where they are so they can grow into themselves. If we don’t meet them where they are, we send them the message that where they are is WRONG! And that’s not a message we really mean to give. 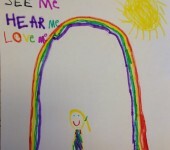 See Me Hear Me Love Me is not more guilt-making on busy, tired parents. It’s a reminder to stop and shift out of adult mode into kid mode so you really can see, hear and love your child in this particular crazy-making moment. But these aren’t going away any time soon. Best we accept them as “our world” and smile while we hit the “shift key” to “kid world”. What’s the See Me Hear Me Love Me alternative? When your child’s emotions escalate, observe and listen. It’s a challenge for grown-ups to maturely express anger and frustration or to lovingly listen to sadness (remember how much we needed Sadness in the movie Inside Out). It takes tons more practice to acknowledge what your child feels. 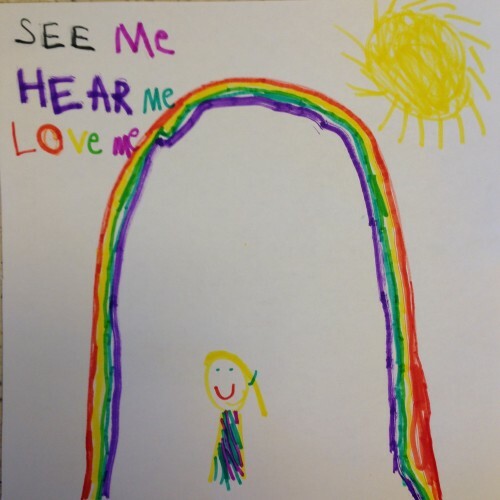 In order to be a See Me Hear Me Love Me parent, you want to actually be ready to see-hear-love your child through all their feelings. Take a deep breath and bring out the most loving mirror you can hold by saying simple phrases like: I see you’re getting upset. I hear you are really mad about that. I am right here to help. Be on the same side…that’s the unconditional love. Sometimes it feels like your child is deliberately pushing your buttons. Part of that is becoming a separate person from you – wanting everything “my way” even when your way is much easier. Sometimes, your child is really struggling and can’t stop themselves. That’s usually when they need us most, not to give in or to give up on them but to help them master challenging emotions or challenging demands. For example, if your child is struggling with bedtime, it doesn’t help to change the routine or the expectations when they truly need sleep to rebuild body and brain. It also doesn’t help to work against them – do this now…or else! What helps is to acknowledge that this is really hard (to turn off the day, to know that daddy checks on them when their eyes are closed, to believe that tomorrow is coming and it’s going to be a fun day). And the grown-ups are here to help you, teach you, believe in you – by checking on you, reading your favorite stories or singing your favorite songs, and by staying consistent even when you are uncertain and confused. Connect the dots for them – teaching and waiting for learning to catch up. Is there anything worse that facing a steep learning curve and someone demanding perfection? Children need us to stay focused on their potential and their success while they are learning – no they will not wear diapers to kindergarten and no they will not bite friends or enemies forever. They are smart, capable and successful yet they do need someone smarter than they are to show them how to do challenging a complicated things – like reading, writing and coding. Short cuts and easy praise won’t take them to their fullest potential but a parent who is willing to listen and engage every step of the way will. Believe that what you know is enough for today. It’s not easy to think for two – to imagine what your child feels and needs. It’s not easy to remember what it’s like to be a toddler, a preschooler or a kindergartner. But that little person still lives within you and you have a lifetime of experience to help and support your child. Your child doesn’t need a know-it-all perfect-parent. Your child needs a parent who understands his mistakes and his need for help. Your child needs someone who loves him exactly as he is…today…right now. Caterpillars do become butterflies. You just have to nurture and protect the caterpillar who moves way too slowly and isn’t quite as beautiful in this stage. Your butterfly will fly! But please don’t ask the caterpillar to fly…he’s really can’t do it…yet.